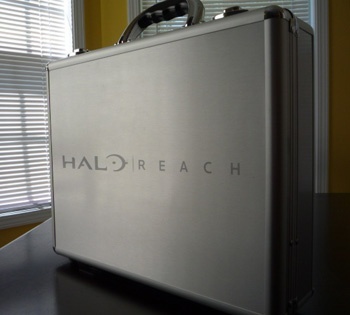 Microsoft is now shipping a special VIP edition of Halo Reach containing the game, a custom controller and a copy of the novel The Fall of Reach. Let the jealousy begin. Almost all game companies issue a press kit for their upcoming games, especially if they've put a few years in on them, or are having an event. Typically, these press kits contain a disc of images and screenshots, a one-page list of bullet points about the game and - perhaps - some kind of gewgaw. Bungie turned that universe on its head three years ago with its outrageous Halo 3 VIP swag bags, and this year has done it again with a limited edition of Halo Reach. Upping the ante from the standard, Limited and Legendary editions, this special edition comes in an aluminum briefcase laser-etched with the title of the game. Inside are the game, the Overture art and background book, a special report on the game's "Winter Contingency," a copy of the novel The Fall of Reach and a custom Halo Reach Xbox 360 controller. Let the jealousy begin. We took pictures.